Anyway back to the point of this post. 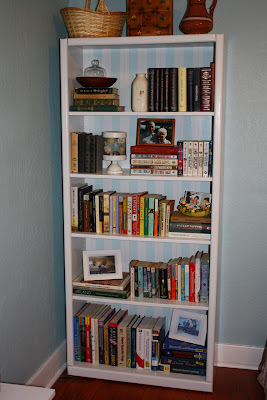 We were given a couple of oak bookcases when we first moved into our house. 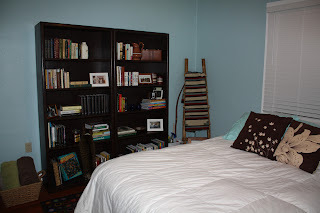 I have had this dream of having a library full of books, bookshelves from the floor to the ceiling, so I have the beginnings of a book collection that needed a home. So with Brian's help I decided to paint the bookcases a chocolate brown. 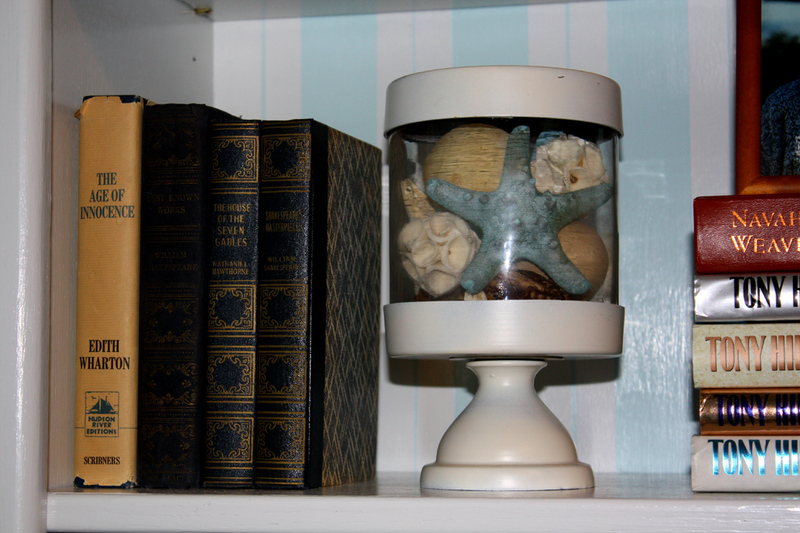 We thought the color would look nice and they would also contrast nicely with the light blue of the guest bedroom where we would put them. We liked the color but the size and placement just wasn't working. We had put them right next to one another on the wall by the door so it made things feel a bit cramped when entering the room. I tried moving them to a wall across the room from the doorway on either side of a window but that still didn't work so well. I next thought maybe if they were a lighter color that would help things out a bit so I got to painting and covered up the brown with white. 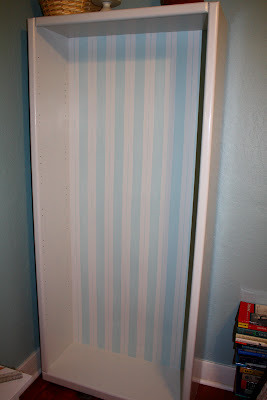 But I couldn't stop there so I decided to paint stripes on the back! I talked with Brian about color options, I was debating a light cream, tan, light blue or yellow. 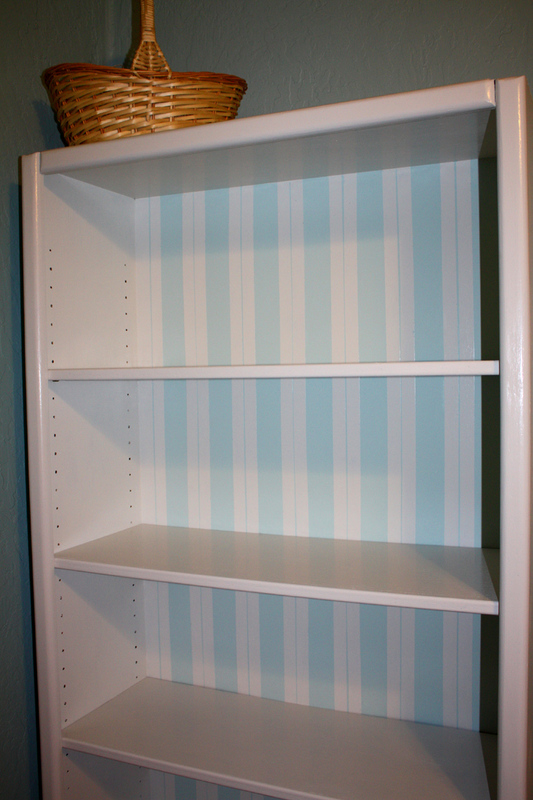 Brian thought the blue would be nice so I got to work measuring out 2 inch sections on the bookcase back and applying tape to mark-off the areas to be left unpainted. I noticed when I was putting on the tape that there was a small stripe between the two pieces of tape. 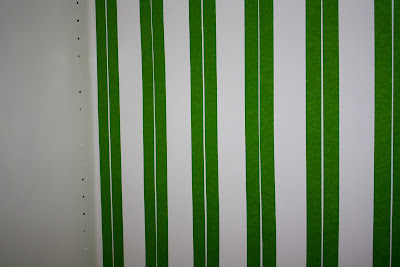 I'm not sure if my measuring was a bit off or the tape is slightly narrow than 1 inch but the extra stripe worked for me ........ now my stripes would be ticking stripes! Next I got to work applying two coats of blue paint I already had, Martha Stewart's "Enamelware" that I had already used for the magazine rack. It is slightly lighter than the blue of the walls. 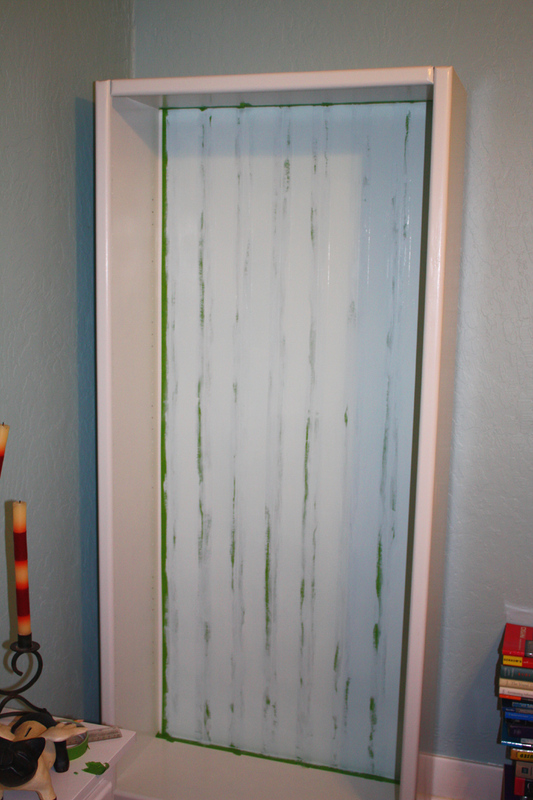 And when it finally dried I was able to peel-off the tape and see what I had done. 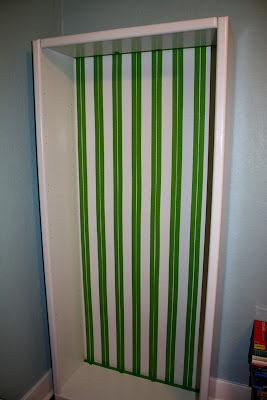 The "Frog Tape" I used worked wonders, there was no seep-through along the edges of the tape! 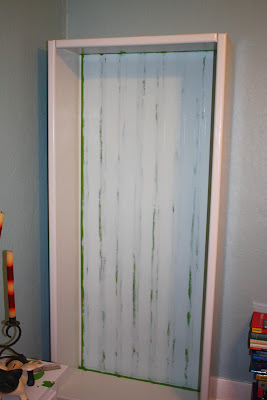 Don't you hate when you have finished painting and excitedly peel-off the tape only to reveal the paint had seeped under the tape, ugh! 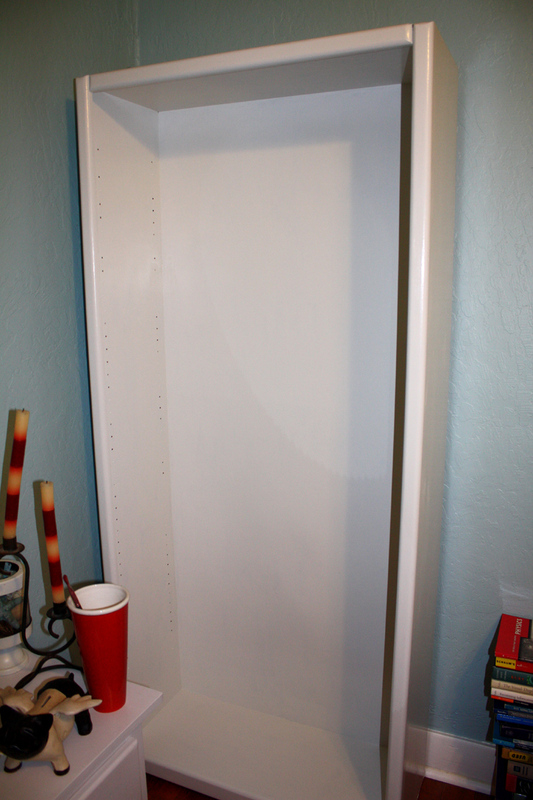 And then I put the shelves back in, and I had a brand new bookcase. Isn't it cute! 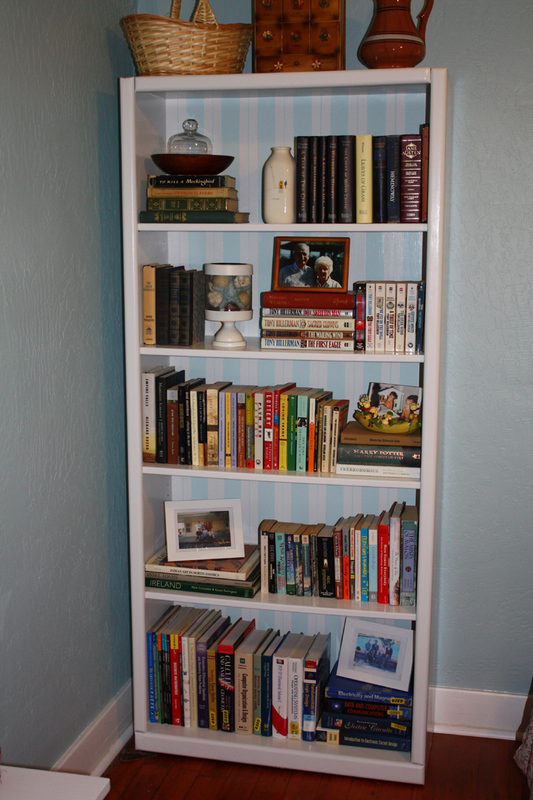 And no bookcase is complete without books, so I got to work filling it up. He cute! 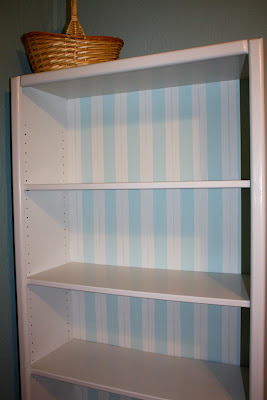 But what a pain to paint them twice, I don't know if I'd have as much patience as you to do stripes :). They look great! I like the stripe in between, makes it look even more custom! (how cute). I hate that automatic word thingy on my phone! This is a combination of linky party (where we can show off our creations) and of blog hop (where we can follow as many excellent bloggers as we like), hence the name Creative Bloggers' Party & Hop. It's a great way to meet awesome creative bloggers like you and increase your followers in the process. All you have to do is 1) link up whatever creative post you'd like to share - can be a DIY project, decor, photography, crafts, recipes, poem, thrift finds, tips, or that informative syndicated post that can make us laugh, or cry - in short, whatever you're proud of! 2) Then follow as many blogs as your heart desires, preferably starting first with the one before you and after you, and leave a comment to them that you're doing so. Wow! This is so great and SO brave of you! 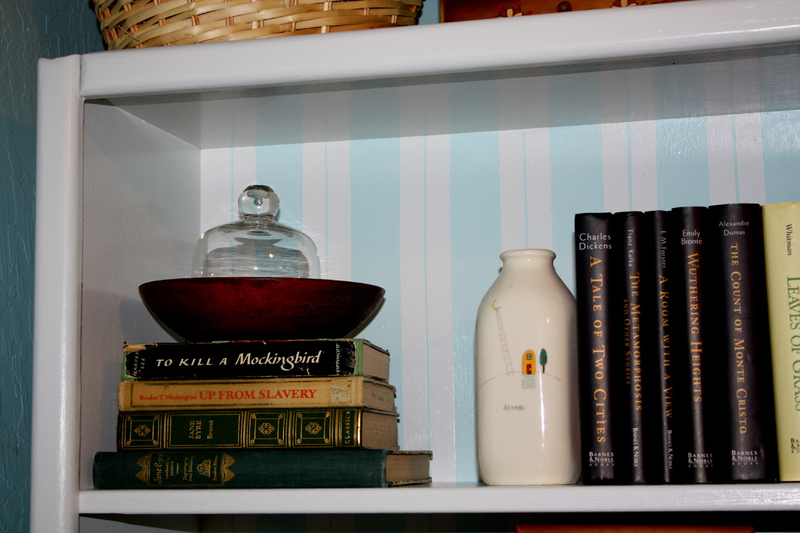 I thought it was wallpaper at first -- can't believe how nice and neat your stripes turned out and I agree -- it's the perfect color! I like the tiny stripe! I think it looks great! I love your home, looks like an English cottage. Your newest follower. Thanks for visiting me. love the result! 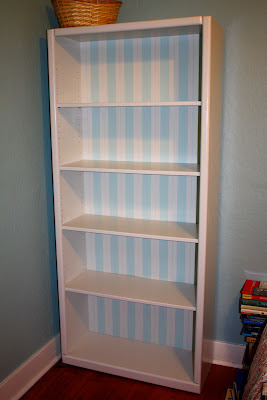 great tips too, i also have a small house and sometimes it's hard to re arrange things or add more furniture coz the lack of space, love the stripe of blue and white color you chose! Thanks Everyone! 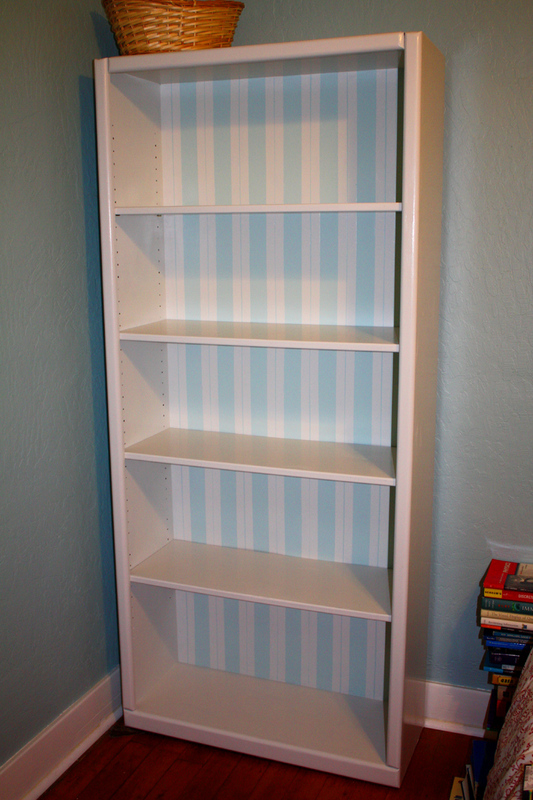 I thought it turned out pretty well too, now I just have to tackle the other bookcase! Thanks for stopping by! i absolutely love how that worked out for you! and the color is gorgeous. it looks so classic and beachy! Thanks Cassie! I really love your blog too! I just figured out why the tiny stripe in the middle arose when I went to buy more tape. 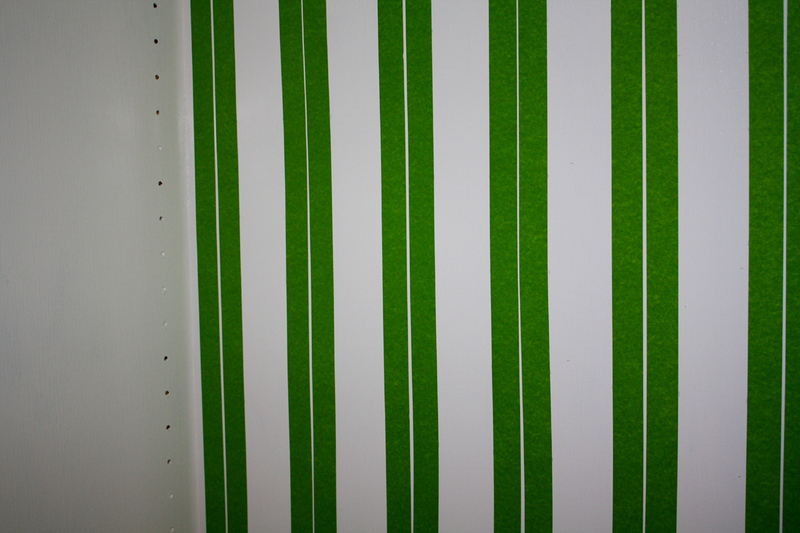 The "Frog Tape" is sold in .94" not a whole 1" so that little bit of extra space gave me the center stripe. Funny how things work out that way sometimes! Love it!!! Thats absolutly what I would love to put in my sons room!!! Great job!!! What a fabulous result! It really makes the books stand out. Wonderfully well-done! Yay, you came! 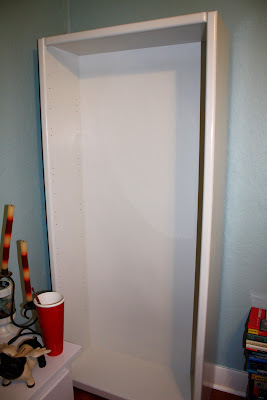 This bookcase is totally different now - for the better :) Really appreciate you sharing this great post with us at the Creative Bloggers' Party & Hop. Looks gorgeous! 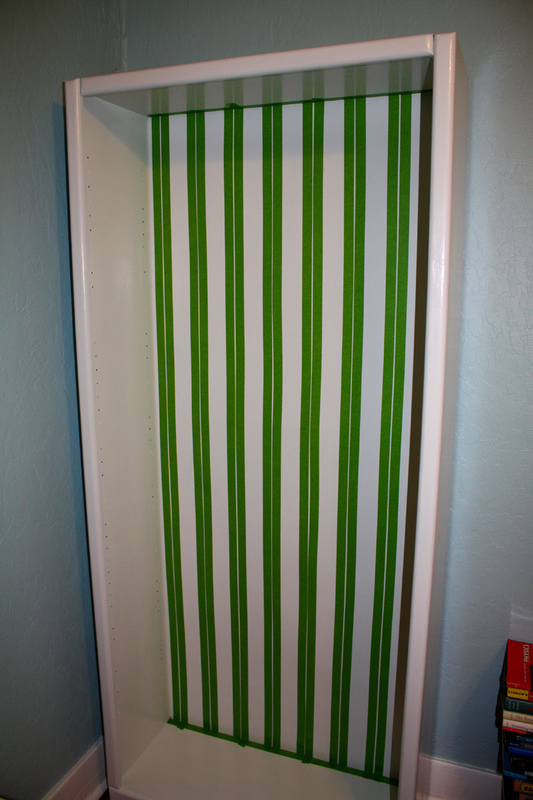 I love the dimensions that the stripes add! You've done a great job! 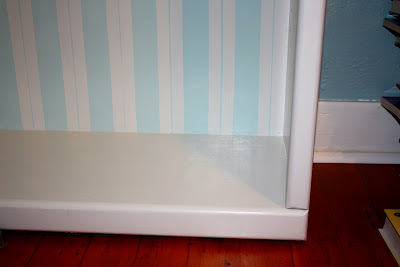 Brian was bang on with the blue, and you have the patience of a saint, two coats of paint, I always cut corners when I can! That's a pretty nice idea because you will see your loads of books as you wake up. It's going to remind you of the beautiful stories you got from those books. If it's too much though, I suggest you keep them at the storage services in Perth because it's going to be safe in there.